Make your New Year's Resolution be good nutrition for your teeth! 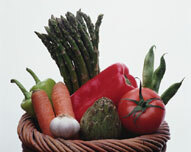 It has long been known that good nutrition and a well-balanced diet is one of the best defenses for your oral health. Providing your body with the right amounts of vitamins and minerals helps your teeth and gums-as well as your immune system-stay strong and ward off infection, decay and disease. There's no discounting the importance of continuing a healthy balanced diet throughout your adult life. Coming soon.